It’s PretzelPhest at the Philly Pretzel Factory. What does that mean for you? I’m so glad you asked: You can purchase 20 pretzels for just $5. I’m not talkin’ frozen grocery-store SuperPretzels here. I’m talkin’ figure-eight-style, Philadelphia-beloved soft pretzels. They’re crispy on the outside, chewy on the inside, and it’s nearly impossible to eat just one. That $5 bulk-buy price means your pretzels cost just a quarter each. I haven’t gotten that good of a deal since I went to Catholic elementary school, where I could buy soft pretzels at snack time. I won’t tell you what year it was. Participating Philly Pretzel Factory locations are offering this special until October 2, 2016. You can make one 20-for-$5 purchase each day, and you can’t combine it with any other offer. Philly Pretzel Factory has tons of locations in Pennsylvania and across the mid-Atlantic. But you can find franchises in Indiana, Georgia, North and South Carolina, Florida and even Texas, too! So, What Can You Do With 20 Pretzels? Grab a bunch before having the gang over to watch the big game. Take ‘em into work as a treat for your co-workers, just because. Bring them to your kids’ scout meeting to keep the kiddos and adult chaperones full and happy. Peel them apart, freeze them, then pull one out about an hour before you’re ready for a snack. Sell them for a buck each as a fundraiser at your school’s next sporting event. Take them to the next party you’re invited to. Perfect hostess gift, says this hostess. Hand them out to the hungry folks you pass on the street every day. Stop by your local fire or police department with a box, just to say thanks. Warm your hands over them while they’re still toasty hot from the store. Thank your lucky stars that soft pretzels exist in your world. 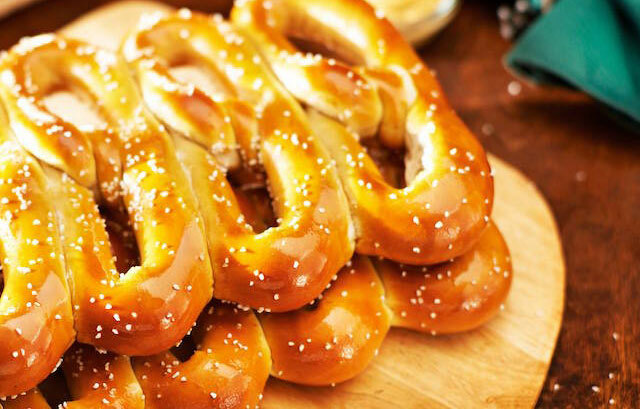 Your Turn: What would you do with 20 pretzels? Lisa Rowan is a writer and producer for The Penny Hoarder. She’s from Philly, and she can never eat just one soft pretzel.